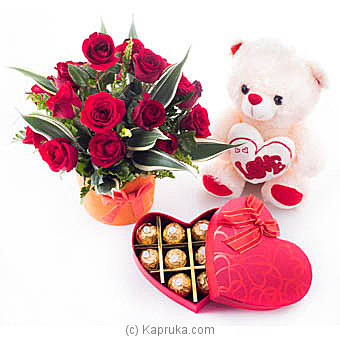 If you want to really win over your love , send a beautiful collection of gifts that will send her heart a flutter. This ravishing red arrangement bursting with roses ,warm teddy hugs and 10 piece of Ferrero chocolates are sure to bring smile on her face. This beautiful flower arrangement has made with 20 Red Roses.